vacancies available in DRDA Subarnapur District Recruitment are 19 posts. Candidates applying for Subarnapur District DRDA Recruitment must have age limit between 18 years to 40 years as on 30-07-2018. Eligible/ Interested candidates download the application for from the Subarnapur district official website www.Subarnapur.nic.in. Application form submission along with specified documents have to submit before 30-07-2018. DRDA Subarnapur District Recruitment selection is based on candidate merit in 10+2/ Intermediate examination. 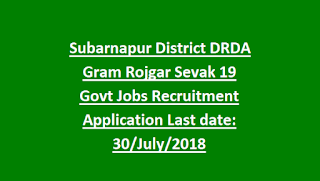 Other details regarding vacancy details, Age limit, Selection process, Age relaxations, Pay Scale, Application procedure details of District Rural Development Agency DRDA Subarnapur Gram Rojgar Sevak govt Jobs Recruitment are provided below. Last date for submission of DRDA Subarnapur Recruitment application forms: 06-08-2018. Total available vacancies in Subarnapur DRDA District Rural Development Agency Recruitment are 19 posts. Name of the Post: Gram Rojgar Sevak: 19 posts. Minimum qualification required is 10+2 pass from recognized board. See the DRDA Notification for more qualifications. Pay scale for DRDA Subarnapur district Recruitment Jobs is Rs.7000/- per month. Maximum age limit is 40 years and minimum age limit is 18 years as on 01-06-2018. Relaxations applicable as per rules. 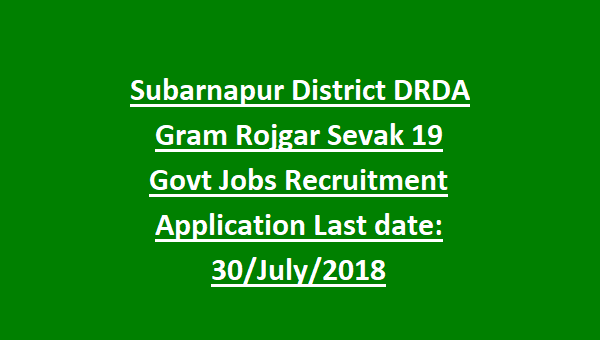 Selection of candidates applying for DRDA Subarnapur Gram Rojgar Sevak Jobs is based on 10+2 Examination marks/ Intermediate Examination marks. Candidate belonging to the Gram Panchayat area will be given preference, then to Adjacent GPs/ other Gps concerned to the Panchayat Samiti. Candidates with eligible criteria can download the application from the DRDA district website www.Subarnapur.nic.in. Application forms with specified documents have to submit before 30-07-2018 to the below address. List of documents to be submitted: HSC Board certificates & marks sheets, 10+2 certificates & marks sheets, Computer Certificates & mark Sheets, Resident certificates, 2 Passport sized photographs.